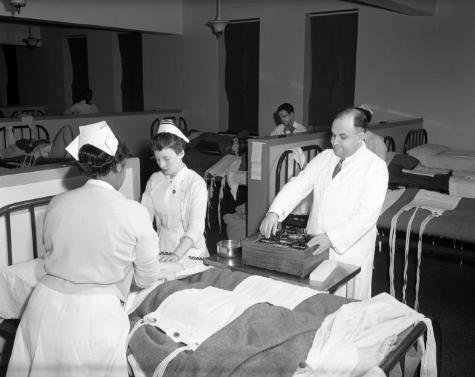 Rockland State Hospital, shock therapy, February 1957. Doctor and nurses preparing to administer electroshock therapy to patient. Source: New York State Archives, New York (State). Office of Mental Health. Public Affairs Office. Photographs of facilities, staff, and patients at mental health institutions, 1954-1975. Series 19131-95, negative 192_12.